Avoid the Dark Side of Content Marketing: Go Inbound! Not all content marketing is created equal. We know that the key to content marketing success is content, but content can come in many different forms. Valuable, relevant and well-written content – the good stuff that will actually bring you business – takes time and energy. The good news is that if your business commits, it will pay off in the end. However, many companies want to take shortcuts – they want the benefits of content marketing without putting in the time. That’s where we run into the dark side of content marketing – attention-grabbing tactics that interrupt people’s flow. So how do you avoid the dark side? Interruption marketing looks to get customers by disrupting a person’s flow and grabbing their attention. Think TV, radio and print ads, outbound sales calls, social media advertising and pop-ups. We know how annoying this type of advertising can be when we are looking for valuable information, but instead get spammed with banners and promotions we are not interested in. While this look-at-me technique may be successful at acquiring some customers, there are several downsides. Ads cost money, are temporary, and often they simply get ignored. 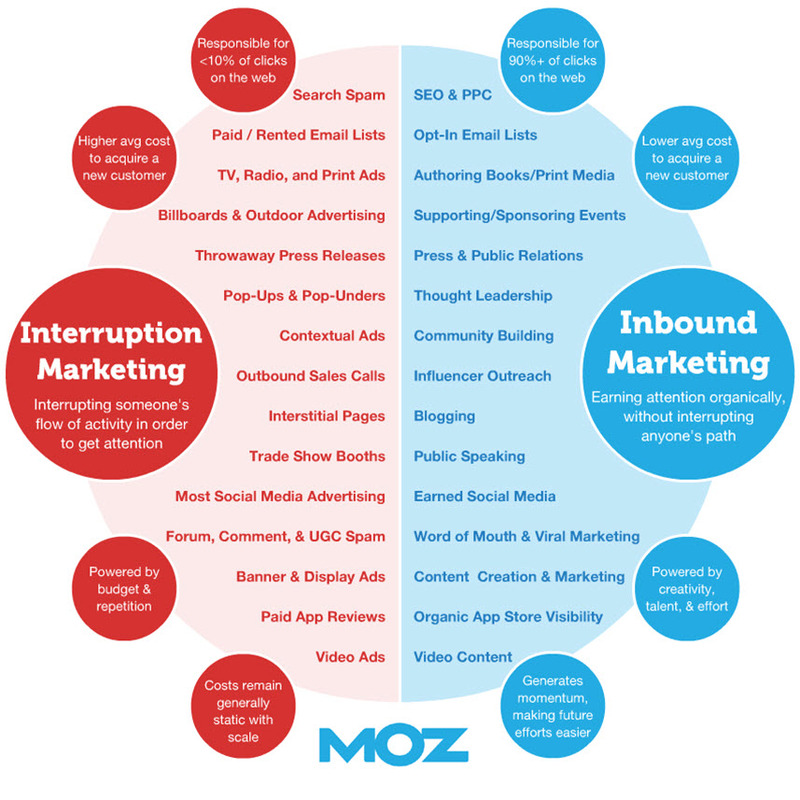 The cost of acquiring a new customer through interruption marketing is much higher than inbound marketing. And, as could be predicted, interruption marketing accounts for less than 10% of clicks on the web. In the end, whatever customers you do acquire will most likely not remain loyal to your brand. Inbound marketing is an approach that aims to attract consumers to your brand and convert them to lasting, brand loyal customers. Rather than disrupting people with techniques that aim to grab attention, this strategy creates content that your audience is actually looking for. Inbound marketing lets you acquire customers in an organic way by helping rather than disrupting your target audience. In short, inbound marketing lets consumers come to you. What makes this strategy even greater is that the reach can be viral and exponential. A traditional billboard ad is seen only by people who pass it, for the duration of the ad. Useful how-to guides, interesting infographics, and entertaining videos, on the other hand, are shared over the web, through social networks, and so on, indefinitely. Content found on company blogs, social media engagement, and email marketing campaigns allows your audience to learn about your company and develop a relationship with your brand. Not only is inbound marketing content responsible for more than 90% of clicks on the web, it can be done internally, for free! Interruption marketing is powered by budget and endless repetition. Your audience will know that and avoid your spam at all costs. On the other hand, inbound marketing is powered by creativity, talent, and effort, and your audience will appreciate your investment and reward you for it! What side of the content marketing force are you on? Let us know in the comments below. Content is King, but Relevance Reigns! Brittany earned her BA at Columbia University, where her enthusiasm for writing and web savvy initiated her career as an online media specialist. As our in-house wordsmith, Brittany is dedicated to providing exciting and relevant web content to each of our clients with the goal of maximizing their online presence and establishing their role as a leader in their industry. If she is not blogging, tweeting, pinning or liking, Brittany can usually be found playing sports, where she loves to beat the boys. She can be contacted at brittany[at]htc.ca.